How to Create a Sitemap Page For Blogger Blog or your wordpress website.Sitemap page will help your readers in easy navigating through your posts in a particular manner. This tutorial will show you how to create a sitemap page for your blogger in a monthly archived fashion. 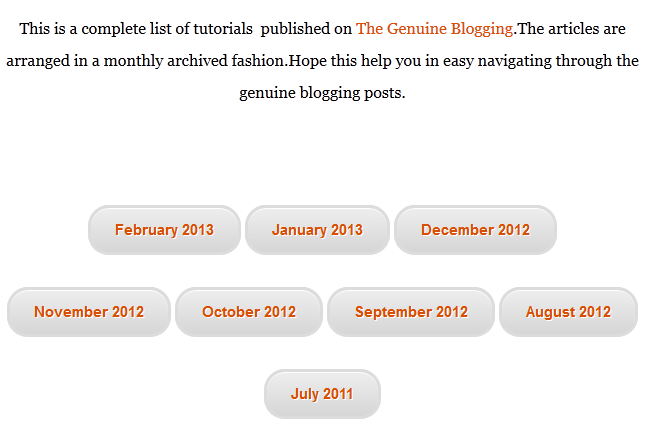 1.Go to your blogger dashboard and select Pages. 2.Create a new page and give some name. 3.click on HTML tab of your page and copy past the following code in it. 1.This code has sitemap for two months you can add more by copy pasting the above bold text. 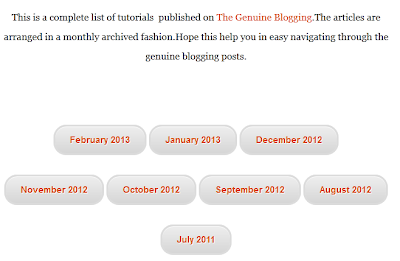 2.Replace the above highlighted red text with your monthly archive blog urls . 3.Replace the above highlighted blue text with the month-year you desire. 4.To maintain space between buttons you can add <br/> for new line. Now publish the page and add your sitemap page URL anywhere in your blog.I would recommend you to add your sitemap page in the footer of your blog.